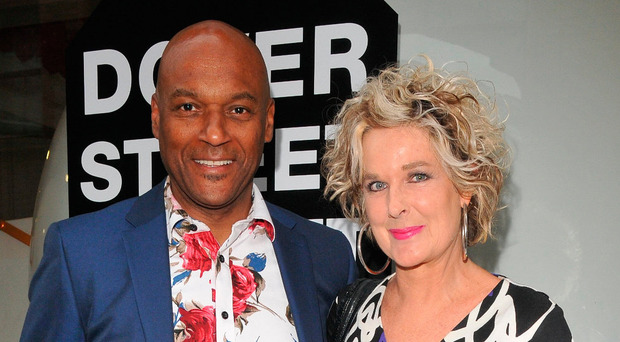 James Bond movie star Colin Salmon, who knows a thing or two about real-life heroes, is proud to place his late Northern Irish father-in-law at the top of the list of people who have inspired him. Colin, who was once touted as a potential first black actor to play 007, says James Hawthorne, a former controller of BBC Northern Ireland, was a giant of a man as he fought the Establishment in London, when they tried to muzzle the media during the Troubles. "I feel privileged to have known him," says Colin, an enthusiastic part-time musician, who is coming back to his "second home" in Northern Ireland this week to take part in the sixth Happy Days Enniskillen International Beckett Festival in Co Fermanagh. Mr Hawthorne, who died in 2006, was in charge of BBC NI from 1978 to 1987, through some of the most turbulent years of the Troubles. He stood up to intense and sustained pressure from Labour and Conservative governments, who wanted him to stage-manage coverage of the news and to stop giving terrorists' views airtime - all this at a time when the headlines were dominated by the murder of Lord Mountbatten, by the hunger strikes, by the Anglo-Irish Agreement and lots more besides. One of the most serious disputes was over the banning and subsequent transmission of a Real Lives documentary in 1985, profiling former IRA chief Martin McGuinness. "Jimmy talked me through it all," says Colin. "He took me through his archive, which he wrote rather than a book. And I know the challenges he faced. He had a very important role in Northern Ireland and he used to say that his office was probably one of the few places where the two sides would meet, because they both wanted access to the airwaves." Mr Hawthorne faced death-threats during his tenure in Broadcasting House and there were reportedly times that he had to pack his wife and family out of the province. But Colin says he kept a lot of the dangers to himself. Colin met Jimmy's daughter, Fiona, who's a renowned artist and illustrator, through the theatre. Not in the theatre, but outside it. He explains: "I was busking outside the Tricycle Theatre in Kilburn, London, in 1986. And when I finished playing, I wandered into the bar. I looked across and saw Fiona. Her eyes were amazing. Thankfully we hooked up." Colin has described Fiona as "an incredible woman, with amazing wisdom, patience and kindness". He has spoken in the past of how she helped him to cope after his mother, who had been suffering from depression, died by suicide. He was a regular visitor to Northern Ireland to visit the Hawthorne family throughout the Troubles. He recalls: "As an Englishman, I had to be very mindful of where I went. "But I remember playing the trumpet in the old Rotterdam Bar and we also went to Donegal and I joined in jam sessions in Bunbeg." Colin has to pinch himself at how much Belfast has changed since his first trip over more than 30 years ago. "It's like a different place," he says. "The young people seem to be moving forward and the older, wiser heads deserve a lot of credit too. "And my father-in-law would have loved the diversity of Belfast today. Jimmy taught me a lot about how to manage situations, rather than stomping my feet. He also taught me to love the rocks, to love the earth, to love Ireland. I've had a strong pull to Northern Ireland and to Ireland for as long as I can remember. It's a very special place." He and Fiona married in 1988 and they have four children - Sasha, Rudi, Eden and Ben. Colin is now regarded as something of an honorary Ulsterman, having spent months filming his role of General Zod in the first season of the TV sci-fi series Krypton, a Superman prequel. Made at the new Belfast Harbour studios, the series is to air on E4 next month. "I'm looking forward to coming back to work on Krypton's second season and being in Belfast for up to five months. I had a fabulous time the first time around. I was living on the Lisburn Road and I'm not the sort of actor who hides himself away," he says - a comment which might just be a contender for the understatement of the year award. For Colin totally immerses himself in the everyday life of Belfast. He says: "I'm always keen to get involved in different things. There is so much happening in Belfast. An added bonus was Fiona was able to spend some time with me too." Colin takes his acting work seriously and his early-morning starts in Belfast aren't impaired by his social sorties, because he no longer drinks. He says: "I feel like a farmer now. I think that, when the sun comes up, I should get up and plough a field." Music is his indulgence. A former drummer in a punk band, he's now a highly respected trumpeter, who has his own jazz quartet who are regulars at The Dorchester in London and at the Cheltenham Jazz Festival. In Belfast, he played "under-the-radar" gigs in Cafe Conor on the Stranmillis Road along with other musicians, including the guitarist son of his friend, the celebrated artist Neil Shawcross. In London, Colin and Fiona are also members of the Notting Hill carnival band and he is also a committed supporter of a number of charities, including leukaemia research and a hospice. He is also an ambassador for The Prince's Trust and plans to help it out in Belfast when he's over. Colin (55) didn't need a second invitation to become the Beckett Reader in Residence at the Happy Days festival. Part of the three-week Arts Over Borders project, it also includes a festival dedicated to the playwright Brian Friel this month. Starting on Friday night, Colin will be giving readings in places that would not normally be associated with theatre, though one of them, Enniskillen police station, has probably seen more than its fair share of drama down the years. Another venue is Devenish island, to which the audience will be ferried on boats on Saturday morning. Back in town the next day, Colin will be reading a short piece of prose in St McCartan's Cathedral as a prelude to a performance of Winterreise by Franz Schubert, Beckett's favourite music. Colin, who says the unusual settings will become like another character in the presentations, doesn't claim to be an expert on Portora Royal-educated writer Nobel prize-winner Beckett. "But I think that's an important part of the festival. People who are not necessarily fans of Beckett can dip in and have a look. He was a writer who was ahead of his time and people are catching up with him more and more," he says. He nearly took part in a production of Beckett's play Waiting For Godot a while back, but the offer of a role in the post-apocalyptic film Mortal Engines meant that Godot had to wait for him. By a happy twist, one of the producers on Mortal Engines was Philippa Boyens, a former lecturer on Beckett who also worked on Lord Of The Rings. "When I mentioned the festival in Enniskillen to her, she was very excited," says Colin, who shares one of Beckett's passions ... for cricket. Beckett was a talented cricketer as a batsman and medium-pace bowler and he played for Dublin University, including two first-class games against Northamptonshire. Colin says: "Like him, I think cricket is a fantastic game. It's a manifestation of a system." Colin has devised a new form of the game, called 'cage cricket', whose blurb says it is "played in an enclosed space at a fast pace and embracing cutting-edge technology, the only form of competitive cricket played as an individual". "It's all about re-engaging with kids on the street to encourage them to play cricket," he says. "I used to play on the street, but roads are too busy now. Our game can be played in any urban environment in a multi-use games area. We have even gone into prisons to spread the message." He loves golf, but usually plays only in Ireland. "I don't know why, but there's just something very different about Irish golf courses that appeals to me." One exception to his Ireland-only golfing rule came eight years ago, when he played in a charity tournament organised by acting friend Samuel L Jackson in Switzerland. Colin's celebrity stock rose after he landed the role of Charles Robinson, the second-in-command to M in three Bond movies: Tomorrow Never Dies; The World is Not Enough and Die Another Day. In the future, Colin says he wants to come back to the Bond movies in the role of M, the head of MI6 currently played by Ralph Fiennes. At one point, there was speculation that Colin might be recruited to play James Bond himself and, though he said he believed he could fill 007's shoes, he insisted he didn't want to get the part purely because of the colour of his skin. In the end, the part went to Daniel Craig who Colin says is doing a great job. Colin's big break in British television came in Prime Suspect 2, opposite Helen Mirren, but he has also starred in the Resident Evil movie series and a huge number of other TV shows, both here and across the Atlantic. Ironically, however, his role in Kiefer Sutherland's hit American series, 24: Live Another Day, was filmed 20 minutes from his front door in London. Colin has revelled in playing police officers, hard men and villains throughout his career, but thousands of TV viewers saw his softer side as a contestant on Strictly Come Dancing. He and his partner Kristina Rihanoff were eliminated after a dance-off in week five, but the actor says it was still one of the most enjoyable experiences of his life. Colin says he has few issues with the fame game. He laughs: "It's usually only after people have walked past me that they think they've recognised me and, by then, I'm gone."